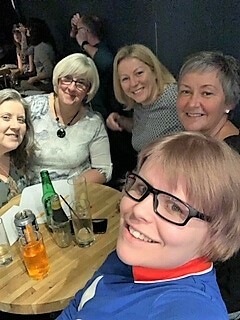 On 23rd November, Busega Scotland trustees hosted one of their flagship Quiz Nights at the Drouthy Cobbler in Elgin. Fourteen teams took part, and in addition to the regular quiz there was a Heads and Tails, a Hairy Bottle and Raffle to entertain the crowd. Andy Lees and Mike McClafferty fronted the event, and most teams were relieved to avoid the booby prize for last place – tubes of Smarties (such delicious irony!). The smiling picture shows the team from Alba Place, who said they had a great night and were delighted not to finish bottom! The winners were the ‘Only here for the Beer’, who, unbelievably, had only a team of three against other tables of four. The Quiz Night raised funds for Shida, the nine year old girl at Mayega Children’s Centre with severe sight problems. The £718 will pay for further treatment, and give a very brave little girl a chance of a bright future. Busega Scotland has hosted many previous Moray Quiz Nights but the total raised this time is the highest ever. Many thanks to all who made the event possible, and took part. « 25.11.18 He has done it again!